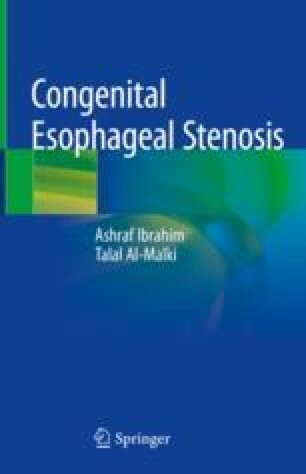 Congenital membranous disease of the esophagus (MD) is actually the rarest of all types of CES. The non perforated isolated type of MD is a very rare type of esophageal atresia. The site of obstruction is in the middle or distal esophagus and it presents like EA. The diagnosis is confirmed by esophagogram and esophagoscopy. The non perforated MD associated with EA has symptoms and signs of EA and Chest X Ray and abdomen show coiled NGT in the upper pouch and gasless abdomen. It is always mandatory to pass a NGT before completing the esophageal anastomosis to discover the web in the distal esophagus. The web is also reported associated with isolated TEF. The congenital perforated MD of the esophagus is usually seen beyond the neonatal period specifically when starting solid food. The main diagnostic tools are esophagogram and fiberoptic-esophagoscopy. If balloon dilatation is not successful, then endoscopic electrocauterizaion with the aid of balloon dilatation can be used.